Simple, must be served warm, must be served with chips and no, I won’t eat the leftovers. That’s my egg salad motto and I’m sticking to it. Will I eat your egg salad? Probably not. Will you want to eat mine? Probably not but that’s ok. All the more for me. Boiling eggs? It’s important to start with cold water that just covers the eggs. As soon as it comes to a boil, turn it down to simmer and let it gently boil for 15 minutes. Now here comes the important part. PICKLES!!! 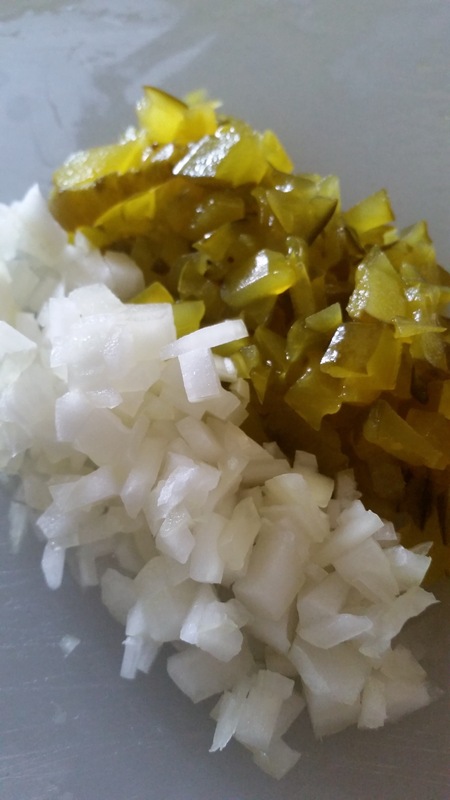 I only use sweet hamburger pickles / chips…..and I use a LOT of them. 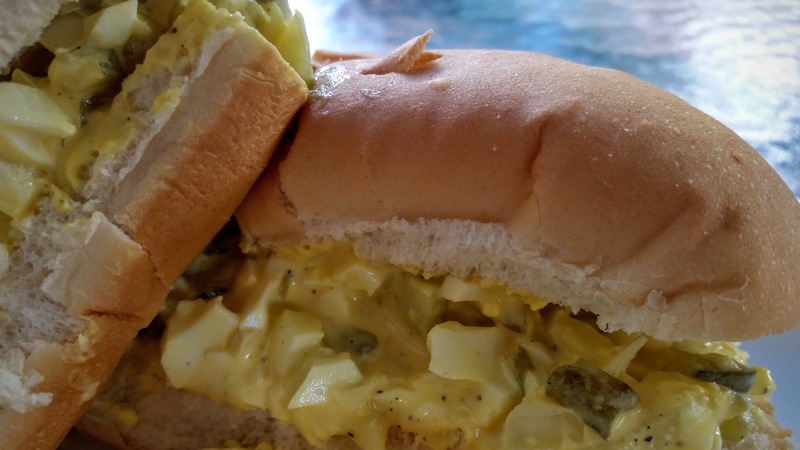 There can never be too many pickles in egg salad. Ok, the onion is important, too, but I’ve used onion powder in a pinch. It’s all about the pickles! Next comes another very VERY important ingredient. The yellow mustard. Not Dijon but straight up yellow mustard. So the mayo is a given. 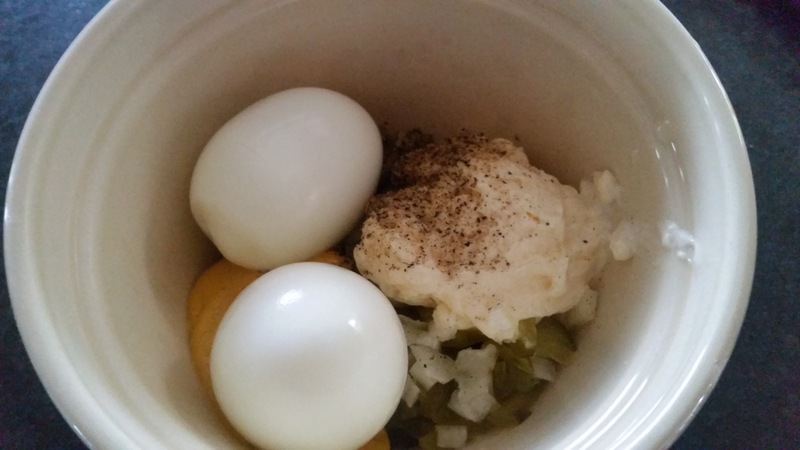 Do you prefer a wet or dry egg salad? I prefer mine slightly soupy so I never need to apply mayo to the bread. Speaking of bread, I want a super soft bread. I prefer sandwich bread but I had some sub rolls that I needed to dive into, (I was very motivated to make my lunches on Monday….not so much come Thursday). The eggs. Very, very important. 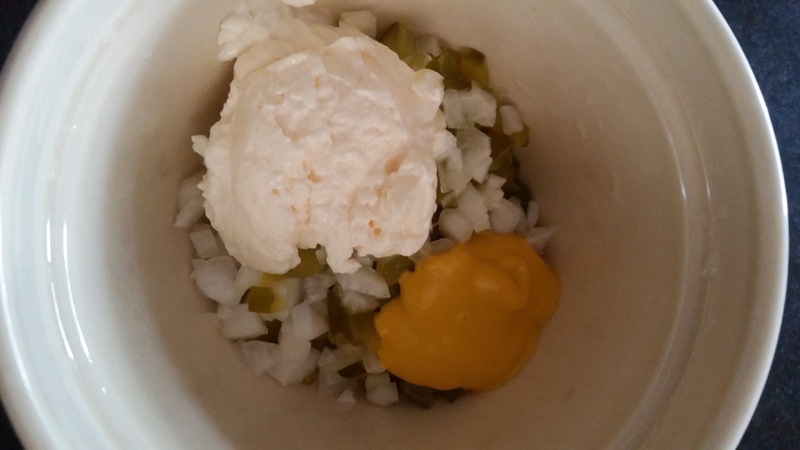 They must be warm when added to the mayo, pickles, onions, mustard, salt and pepper. After draining the water, I run warm water over them, while peeling off the shell. Now it’s time to break out that steak knife and go hand to hand combat, while they’re in the bowl. And if you’re at my house, this is done QUICKLY. After all, I must have it served warm. Slice your choice of bread and lather on the yumminess. Then, break out the chips. After all, you need something to scoop up all the warm goodness that falls out of your sandwich. All of the quantities above are totally up to you and how you prefer your egg salad. Place the eggs in a shallow pan and cover with cold water. Once they come up to a boil, reduce the heat to low for 15-18 minutes. Dice the pickles and onion. Add them to the bowl of mayo, mustard, salt and pepper.